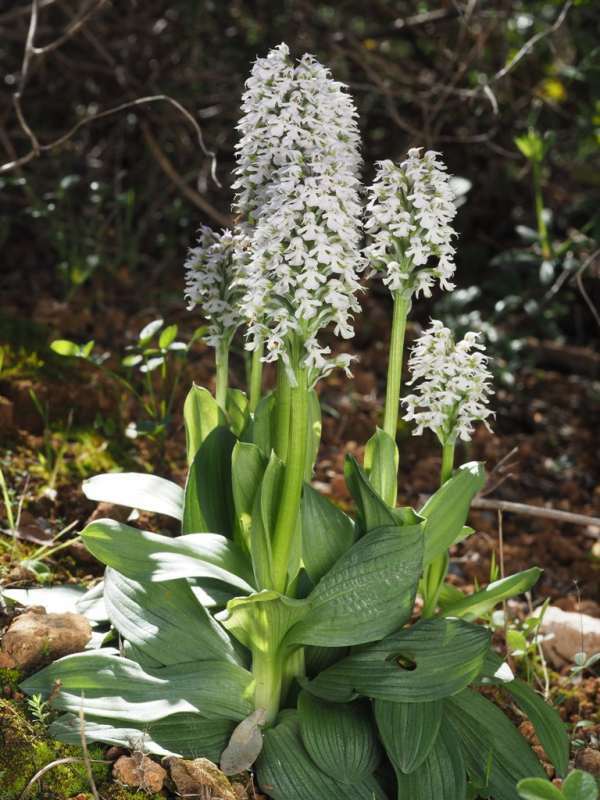 Three very similar looking orchids, formally known as Orchis conica, Orchis lactea and Orchis tridentata have recently been moved from the Orchis genus to the Neotinea genus where they join the former Orchis intacta which is now called Neotinea maculata. Despite their large geographical range, many authorities have long suspected that the morphological similarities between O. conica, O. lactea and O. tridentata indicate a very close relationship, and this has now been confirmed by molecular study. These orchids are now sometimes simply referred to by the synonyms Neotinea conica, Neotinea lactea and Neotinea tridentata. Above: This splendid group of Conical Orchids was photographed in the Algarve region of southern Portugal by Simon Tarrant. Growing to around 40cm tall Neotinea tridentata subsp. conica has up to 8 basal leaves and a dense inflorescence of pale pink (sometimes almost white) flowers. The sepals and petals are strongly marked with dark green veining and form a hood above the lip of the flower. The lip is marked with pink dots and is deeply divided into a central lobe and two almost horizontal side lobes. The infloresence bears similarities to Neotinea tridenta in shape, but the flowers have paler pink spots which are more like Neotinea tridentata subsp. lactea (syn. 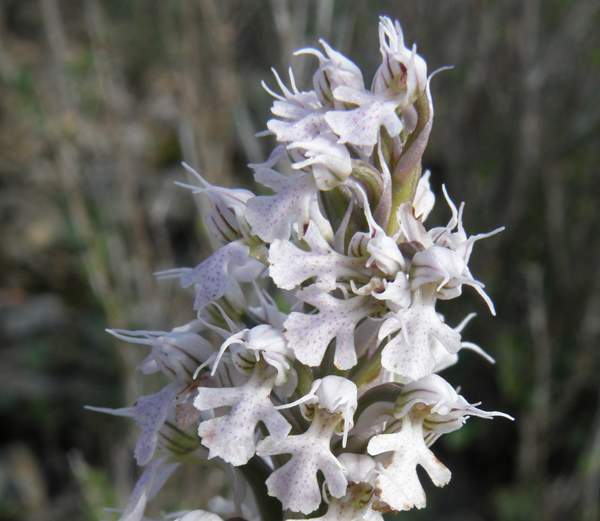 Orchis lactea). 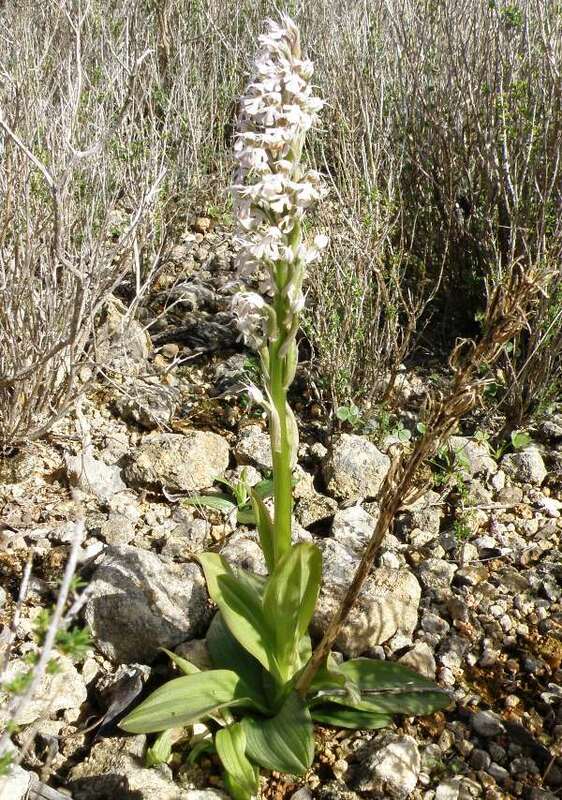 Neotinea conica is found in the Iberian Peninsula (the Algarve and Extremadura in particular), the Balearics, France, Italy, Mallorca, Sicily, Malta and Sardinia. Neotinea conica grows in full sun or mid-shade on alkaline-to-slightly acidic soils and tolerates dry conditions well. It flowers from February to early May. Good places to look for it are in open areas of short-sward grasslands and on the edges of open, sunlit woodland sites. The plants shown on this page were photographed in the Algarve region of Portugal close to Bensafrim (top) and Paderne (centre and bottom).